Do you have a professional speaker, entertainer, and TEDx speaker in your corner pitching your product? Present your message like no other presentations on earth. Dale’s presentations are unique, memorable, and focused on your company’s key points. Dale helps prospects connect with your sales and marketing team, making it easier for your team to produce leads. Requires only 3.5 foot to 4 foot of booth space. The presentation is front/center of the booth for highest traffic and maximum impact. Dale’s stage presence makes for a great formal presentation. Requires a stage or platform with seating to draw larger crowds to a booth. Presentations may run 2 to 3 times an hour. Leaving your booth is an army of fans who proudly strut around the exhibit hall showing off custom art and talking about your company. Attention, Message, and Leads are easy to obtain when you have the right craftsman working on your behalf. 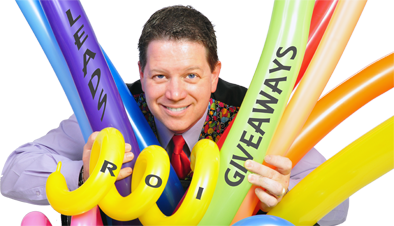 Listen as Dale talks with TradeshowGuy Tim Patterson on how to get your message out to the attendees at a trade show.